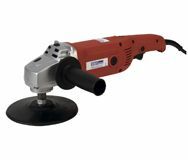 Features six speed power control producing speeds suitable for sanding and polishing. Speeds vary from 1400 to 3000rpm. Alloy bevel gear head with composite motor housing. Supplied with Ø170mm backing pad and side handle.